This Presentation date is September 21, 2018 at 9:30-11:30 local time. Andrey Kudryavtsev, SSD Solutions Architect in HPC, discusses Intel’s vision for Optane, non-volatile memory technology, and their plans for the NAND flash market, including a look at different technologies and form factors. 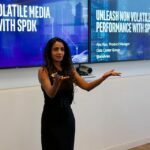 Anu Rao, Product Manager, discusses the latest updates and optimizations of Intel’s Storage Performance Development Kit (SPDK). SPDK is a storage reference software layer designed for non-volatile media of the future, designed to allow for million of IOPS per core, while reducing average and tail latency, wrapped in an open source license. Jim Harris, Principal Software Engineer, provides detail in how SPDK enables storage virtualization and network disaggregation. This session also goes into more detail into SPDK underpinnings including Logical Volumes, and looks at overall performance data.